Enter Ballo Italian Restaurant and Social Club, at the Mohegan Sun in Uncasville, Connecticut, and you feel like you have mysteriously landed in Tuscany. Inspired by San Galgano, a 12th century abbey, the architecture is stunning with Gothic arches, double-sided 158 foot Carrara marble bar that you could land a small plane on, and the food, it is well worth the drive to experience Executive Chef Matthew Adler's inspired menu. The 16,000 square foot restaurant, which opened on September 25, 2011 is a treat for the senses with its soaring columns, Gothic arches, wood paneled ceiling, hardwood floors, antiqued brick walls, antique wall scones and lighting fixtures, and interesting art by the brother of owner John J. Tunney III that add visual appeal. 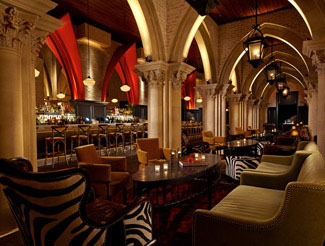 However, it is the double-sided bar that draws the eyes when you enter with its red trimmed Gothic arches and expansive collection of spirits, and the zebra print chairs that accent the inviting lounge sitting area where you can relax with a pre or post dinner cocktail, or opt to have dinner there at one of the low tables. In fact, you can enjoy the full restaurant menu sitting at the bar, in the lounge area, in the private dining rooms, or in the main dining room, allowing guests to create their own dining experience whether elegant fine dining or more relaxed, casual dining. 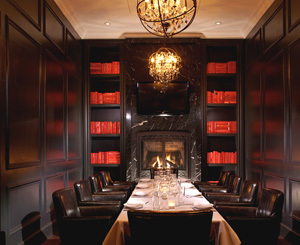 In the main dining room, dark chocolate leather and burnout velvet banquettes and dark wood cane seat chairs flank tables dressed with white linens and votive candles. Antique globe lighting softly illuminates, and low music sets the mood. So removed, it is easy to forget that you are only steps away from the Casino at Mohegan Sun. Edward and I had an outstanding dining experience at the restaurant on July 13, 2012, where we began with cocktails to enjoy with our selections from the Salumi e Formagi (salami and cheeses) section. Edward had the Sicilian Julep one of the cocktails specialita (Specialty Cocktails) made with local Berkshire bourbon, lime, blood orange, and muddled mint, which was a well-crafted cocktail served over ice in a rocks glass. I had the Italian 75, made with prosecco, montepulciano d'abruzzo, Grand Marnier, and orange, garnished with a long lemon twist, and served in a champagne flute. 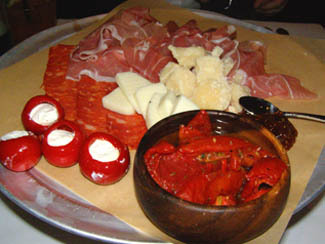 From the Salumi e Formagi section we sampled Assaggi, thinly sliced prosciutto and salumi, farmstead cheese with truffles, roasted tomatoes graced with olive oil, peppadews filled with whipped ricotta, fig jam, and the Hot Coppa, which was thinly sliced spiced salami. Thickly sliced Italian bread warm from the oven accompanied by whipped butter drizzled with olive oil was the perfect companion. 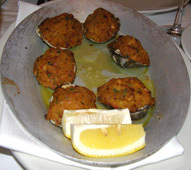 We explored a few items from the Antipasti section beginning with the exceptional Baked Clams, which were six clams stuffed with a mixture of prosciutto, white wine, and breadcrumbs. 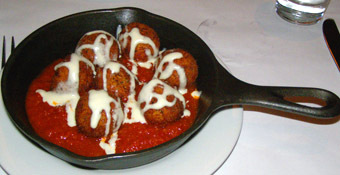 The Arancini, were another highlight, seven tasty round morsels made with deep-fried saffron risotto with crisp exteriors and flavorful creamy interiors drizzled with melted cheese and served on a bed of tomato sauce in a small cast iron skillet, as were the Crispy Artichokes, whole baby artichokes lightly coated, fried, and served with arugula and lemon. 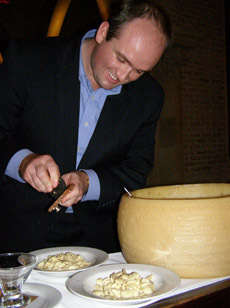 Next, there was a wonderful surprise when Manager Luke Martin rolled out a cart laden with an enormous wheel of hollowed out Parmigiana-Reggiano, a large truffle, housemade orecchiette pasta, olive oil, and grappa, which he used to create the dramatic and exceptionally tasty "Big Cheese." Manager Luke Martin Tableside creating the "Big Cheese"
Luke first poured the grappa over the cheese, ignited it to warm and melt the cheese, and then added the pasta and olive oil and tossed to combine, plated it, and grated truffles over the pasta. To say that this dish was fabulous would be an understatement; words fail to describe the flavors and its appeal, both visually and on the palate. Mangia! 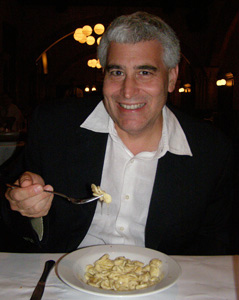 - Edward Nesta digging into the "Big Cheese"
From the Secondi section, Edward had the Grilled Veal Chop, which was a dream. Chef Matthew Adler cooked the chop to absolute perfection, plump, juicy, and pink, and served with fig and goat cheese polenta and balsamic dressed arugula. 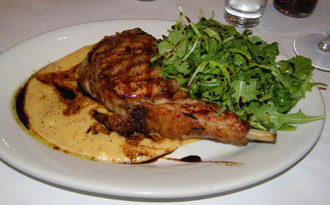 The combination of flavors worked well with the hint of sweetness of the fig to contrast with the slightly bitter arugula adding to the overall balance of the veal and polenta. Edward paired the veal chop with Lechthaler Alto Adige 2009, Pinot Noir. 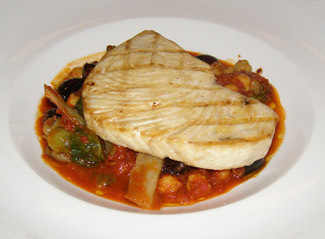 I had the Swordfish Livornaise which was another well-executed dish beautifully presented as grilled swordfish on a bed of escarole, chick peas, black olives, and tomato sauce, which was lovely, especially when paired with the Principessa Gavi Principale, Cortese. We ended our dining experience on a sweet note with the dessert Affogato, served in a tall glass, with scoops of vanilla gelato, Carpana Antica Formula Sweet Vermouth, with a small pitcher of espresso to pour over the gelato to savor a little at a time, or all at once to melt the gelato and create a delicious milkshake. We also had the Tiramisu, presented in a footed glass with a crunchy layer of tiny shaved chocolate curls to complement its hidden delights, which was a nice contrast of textures. However, a restaurant does not succeed solely by the merits of the chef equally important is the FOH (front of house) personnel that can make or break a restaurant. 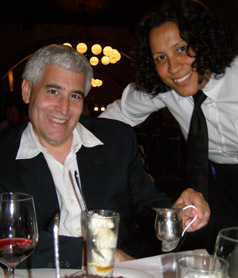 In the case of Ballo Italian Restaurant and Social Club, the FOH team is a dream with high marks and kudos to Manager Luke Martin who personally ensures each guest's satisfaction, and to server (and fellow foodie) Frances Medina who is highly knowledgeable about food and wine, and who goes the extra mile to create a memorable dining experience. Ballo Italian Restaurant and Social Club serves lunch from 12:00 pm until 3:00 pm. Dinner is served Sunday through Thursday from 4:00 pm until 10:00 pm, Friday and Saturday from 4:00 pm until 11:00 pm. There is a Late Night Menu on Friday and Saturday from 11:00 pm until 1:00 am. 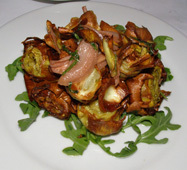 The menu features both traditional Italian classic recipes as well as new inspired dishes. On Friday and Saturday nights beginning at 11:00 pm, the restaurant becomes the Social Club with DJ music and dancing. VIP tables are available with bottle service. 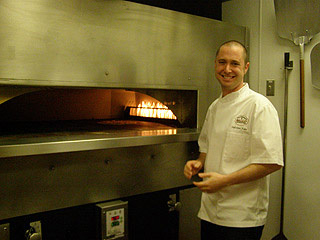 Read Chefs' Recipes for the interview with Executive Chef Matthew Adler who tempts the palate with his tasty creations for Ricotta Gnocchi, and Scallops and Scampi with Corn, Spinach, and Sopressata to inspire a visit to the restaurant. 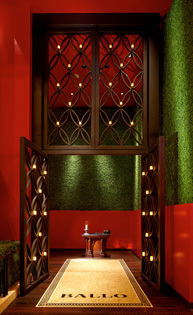 Follow Ballo Italian Restaurant and Social Club on Facebook at www.Facebook.com/BalloItalian, Mohegan Sun on Facebook at www.Facebook.com/MoheganSun, and Luxury Experience on Facebook at www.Facebook.com/LuxuryExperience. Read other materials on Mohegan Sun in the Hotels and Resorts, Restaurants, Chefs' Recipes, Spas, and Performances section. © August 2012. Luxury Experience. www.LuxuryExperience.com. All rights reserved.